In our last posting, we introduced leadscrews, ball screws and linear slides. We’re going to continue with that discussion by considering how accurately the threads are cut into the screw. 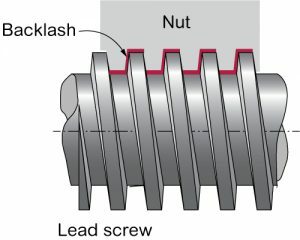 Using the five-pitch screw as an example, we understand that five revolutions are supposed to move the plate one inch, but what happens if the thread is cut too long or too short. Five revolutions might move the plate 0.990” or 1.010”. What is the accumulated accuracy over say a 10” move? Does the screw gain or lose 0.010” for every inch of the move? There should be a “linearity” specification that defines the positional gain or loss per inch of travel. Precision cut or ground screws will be more accurate than a rolled screw. 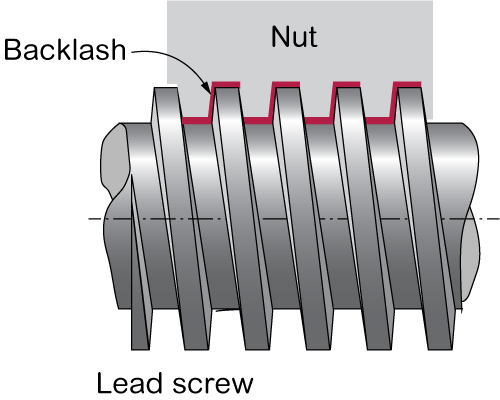 Backlash between the nut and screw. Another parameter is the mechanical backlash. Let’s say that our plate is moving away from the stepper motor to the 6.000” position, then to the 7.000” position and then back to the 6.000” position. Let’s also assume there is 0.002” of space between the thread of the screw and the ball bearings in the ball nut. (There has to be some space for the bearings to rotate otherwise they would skid rather than roll.) When the flat plate is moving away from the stepper motor all the ball bearings will line up against the screw’s threaded edge that is closest to the stepper motor. Moving to the 6.000” position and then the 7.000” is fine because the flat plate is still going away from the stepper motor. What happens when the stepper reverses and returns the flat plate to the 6.000” position? All the ball bearings change sides and now they line up on the screw’s threaded edge that furthest away from the stepper motor. Our linear slide just lost 0.002” of motion because of the ball bearing spacing. Moving back to the 6.000” position would result in a position of 6.002” This positional error is referred to as backlash. One way to accommodate backlash is to always go to the desired position from the same direction. For example: instead of going from 7.000” to 6.000” as I described above, the stepper could go to 5.990 (or any other value less than 5.998” or larger than the known backlash) first and then extended back to the 6.000” location. Thus, each position is being approached from one direction. You could save money by purchasing a less expensive ball screw, but you’d take more time by adding the extra move to get the final position. Hmmm, time vs. money. Where have we heard that before? Ball screw manufactures have a solution for those that have a time critical process. It’s called a double nut. Picture two ball nuts with the same 0.002” clearance as before and install both ball nuts on the ball screw in close proximity to each other. Connect the two nuts together with a spring that is trying to push the two nuts apart. Thus, one ball nut’s bearings are loaded up against one side of the threaded screw and the other ball nut’s bearings are loaded up against the other side of the threaded screw. Out-bound motion (away from the stepper motor) uses one nut’s bearings and in-bound motion uses the other nut’s bearings thus eliminating the backlash. Pretty neat huh? More on lead screws, ball screws and linear slides next time.